Inspired by the recent Peach infographic, I set out to find the least natural fruit in existence, and decided it was probably the modern watermelon. Take a look below: which one would you rather eat? The watermelon, delicious as it is, has increased from 50 mm to 660 mm in diameter, which represents a 1680-fold increase in volume. 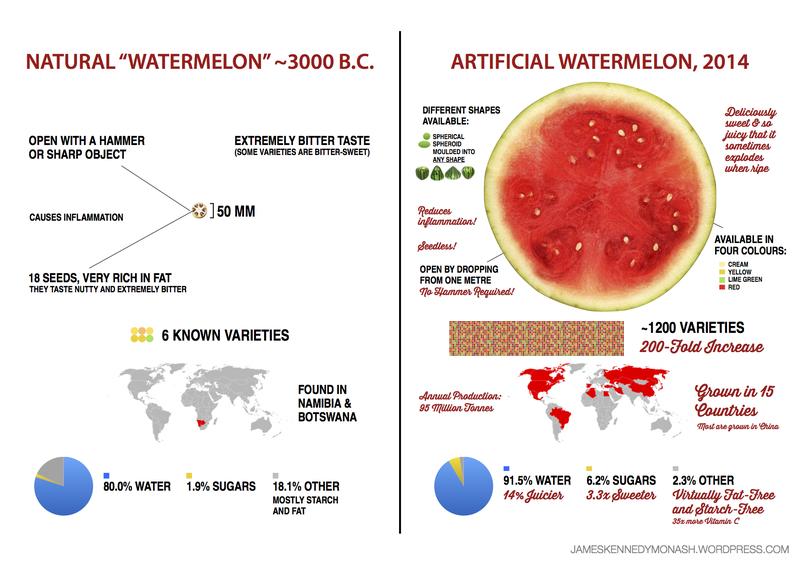 While ancient “wild watermelons” weighed no more than 80 grams, modern watermelons can range from 2 kg to 8 kg in the supermarket, while the Guiness World Record for the heaviest watermelon recorded exceeded 121 kilograms in the year 2000. Thousands of years of human-induced evolution have worked miracles on these fruits. Let’s not forget that they’re completely artificial. The most famous example of artificial selection is of course the selective breeding of the feeble teosinte plant into juicy, delicious, North American sweetcorn. In 9000 years, sweetcorn has become 1000 times larger, 3.5 times sweeter, much easier to peel and much easier to grow than its wild ancestor. It no longer resembles the original teosinte plant at all. Around half of this artificial selection happened since the fifteenth century, when European settlers placed new selection pressures on the crop to suit their exotic taste buds. 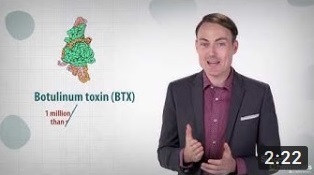 This artificial vs natural foods phenomenon has grown somewhat since the All-Natural Banana. This infographic explores the differences between the natural, “wild peach” and its modern, artificial relative. It explores how the ancient Chinese developed a small, wild fruit (that tasted like a lentil) into the juicy, delicious peaches that we eat today. This image also pays homage to the thousands of years of toil that farmers put into developing the Peach regardless of whether they were aware of it consciously or not. After the wild peach was domesticated in 4000 B.C., farmers selected seeds from the tastiest fruits for re-planting. They tended to the trees for thousands of years, and the fruits became bigger and juicier with each generation. 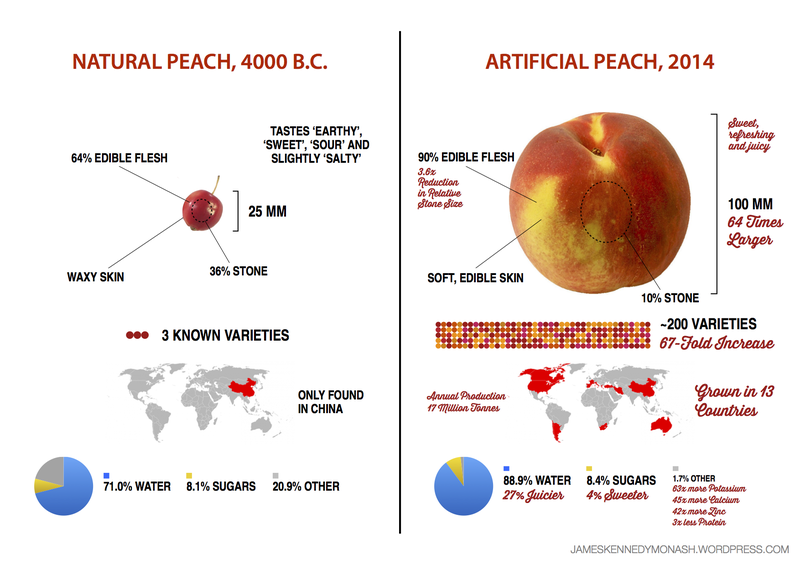 After 6000 years of artificial selection, the resulting Peach was 16 times larger, 27% juicier and 4% sweeter than its wild cousin, and had massive increases in nutrients essential for human survival as well. Which one would you rather eat?